A variation of our best selling Premium After Hip & Knee Surgery Kit but with a slightly different set of clinically-vetted tools. 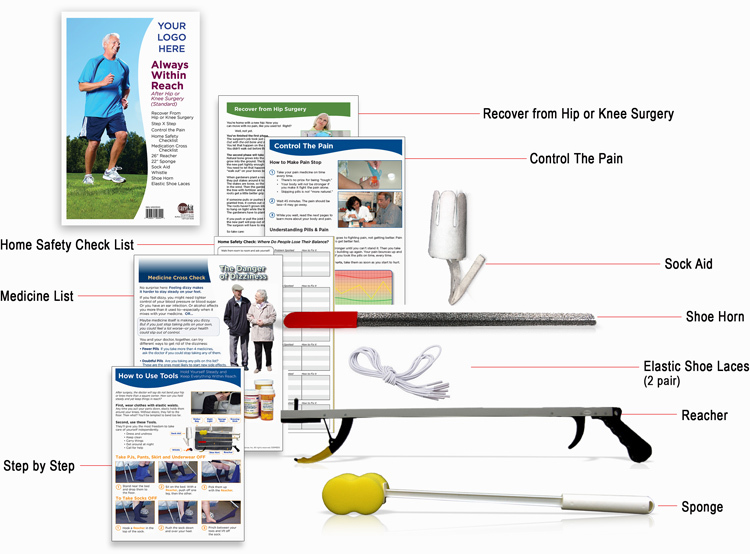 This STANDARD After Hip & Knee Surgery Kit includes two pairs of white elastic shoe laces instead of the dressing stick, night light and whistle found in our Premium kit. Large print and color photos, not tiny black-and-white type, make the materials easy to read and follow. Patients will have a clear understanding of how to use the tools so they recover safely without readmission.